Home > Is Uber Legal in Queensland? Is Uber Legal in Queensland? The controversial ride-sharing application Uber has created a strong divide between governments, the taxi industry and consumers. Out of all Australian states and territories, Queensland is lagging. So what does this mean for you as an Uber driver and most importantly, a consumer who uses Uber to get from Point A to B? 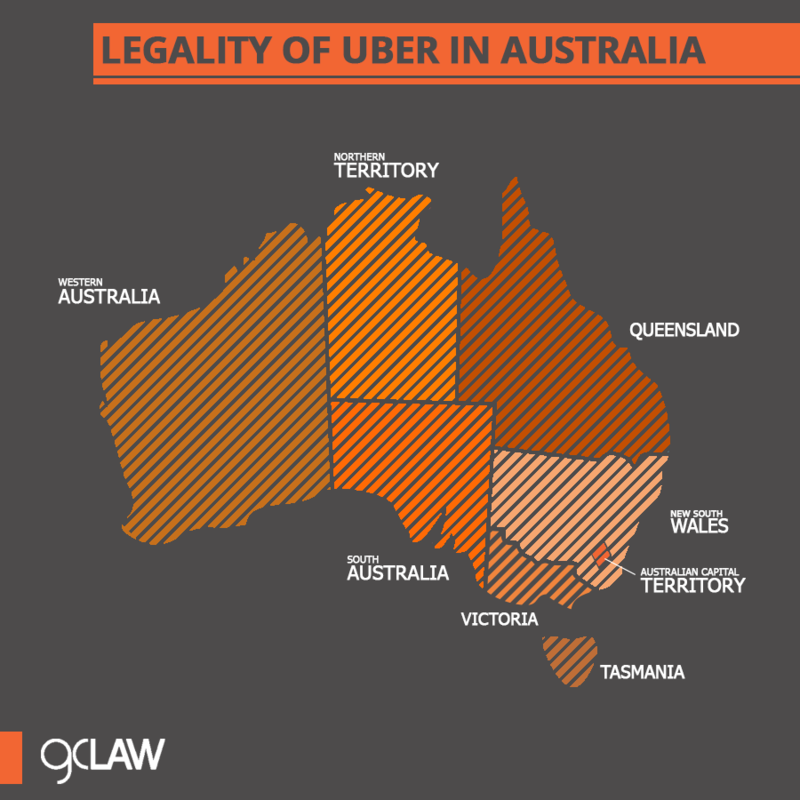 Uber’s legality depends on where you are in Australia. Here is the most recent update on where Uber is legal across Australian states and territories. Queensland – Legalised – Following a review of options for personalised transport in Queensland, ride-booking services such as Uber has been legalised in Queensland from September 5 in 2016. ACT – Uber in ACT is legal since October 2015. Uber drivers must pay $600 application fee and a $50 annual fee to operate in the territory. New South Wales – Legal from mid-July 2016. A $1 levy on all metro trips for all passengers of all services to pay $50 per week for a maximum of 11 months to license holders impacted by legalising Uber. Each taxi license holder will also receive $30,000 compensation on top of this. Tasmania – Legislation is still yet to pass Tasmania’s legislative council. This legislation was introduced in March 2016 which looks at temporarily allowing Uber drivers to operate in the state, provided they pass all the public safety tests that come with being considered a hire car service under Tasmanian law. South Australia – Uber allowed to operate legally in the state from July 1 2016. The same compensation and levy fees that apply in New South Wales will apply in South Australia too. Western Australia – Since December 2015, WA Transport Minister announced the legalisation of Uber by creating a new license category. In May 2016, it was announced $20,000 compensation would be given to each Perth metropolitan-owned taxi plate purchased before the government’s December announcement. This is part of a $27.5 million compensation package for the taxi industry. Northern Territory – Uber has been banned from operating in the Northern Territory. Uber has said it will continue to persist efforts in establishing itself legally in the NT. From September 5, Uber will be legalised in Queensland. Until then, the following information below still applies until this date. Is it illegal to become an Uber driver in Queensland? In QLD, Uber drivers are considered to be “illegal taxis” and police can fine drivers up to $2,336; and Uber can be fined up to $23,560. In April 2016, the Queensland parliament passed legislation which enforced stronger penalties for Uber drivers. These penalties saw the fines for drivers caught operating the illegal service increase by another $923. The Queensland government is conducting a broader review of how personalised transport services are managed. This includes a review into ride sharing apps which is expected to be handed down in August 2016. Can Uber drivers in QLD get into trouble? What are the rights of an Uber driver in the event of a crash? If not at fault, the driver has rights to claim for personal injury on other driver’s CTP insurance. No different to anyone else. In relation to property damage, their own insurance may not cover them, unless they have specific coverage from their insurer to cover Uber drive. Will my insurance cover the damage to my car as an Uber driver? Many Australian insurers have declared that standard private and business policies do not cover Uber trips. If you are an Uber driver and you are involved in an accident, you may be up for not only the cost of repairing your own car, but the other car as well. What are the rights of taxi drivers v Uber drivers? Only a “worker” is covered for workers’ compensation. Uber drivers are not covered by workers’ compensation schemes in QLD, however most taxi drivers are independent contractors and not covered either. Are there any consequences for the Uber passengers or users? What to do if you’re involved in a motor vehicle accident as an Uber passenger? Report the accident to the police as soon as possible and don’t rely on the driver saying they’ll report it on your behalf. Take note of the driver’s details (including license number) and registration of the car. If there were any witnesses to the accident, make sure you get their details. Take photographs of any damage to the Uber vehicle and your surroundings. Report the accident to Uber in writing as soon as possible. Get in touch with a lawyer as soon as possible to explore your legal rights.